Recently, Desh-Videsh sat down with the winner of the 2012 Fort Lauderdale MyShadi Bridal Expo Mehndi Competition, Amber Emkin. Owner of HennaParty.com, Amber has been a mehndi artist for over eight years. Her background in fine arts lends itself nicely to her creative and elaborate designs. Learn more about Amber and what inspires her creative side. Desh-Videsh: What inspired your winning design? Amber: There were several factors that went into the creation of the design. The competition was very specific that the designs were to be “bridal.” That of course can have many meanings as some brides prefer very simple, bold and modern designs and some brides prefer traditional, intricate and detailed designs. As an artist, I have a particular preference when it comes to Bridal mehndi, so that was the specific guiding influence for the competition. This is not always the case when I am working with actual brides, their unique preferences and style become guiding influences when I create their mehndi.For the competition, I wanted the design to have both classic and modern elements, but to be unmistakably Bridal. The design I created is classic in its coverage and style, the lines are fine and intricate and the design covers the entire forearm. I gave it a modern look through the use of colors, glitter and crystals. 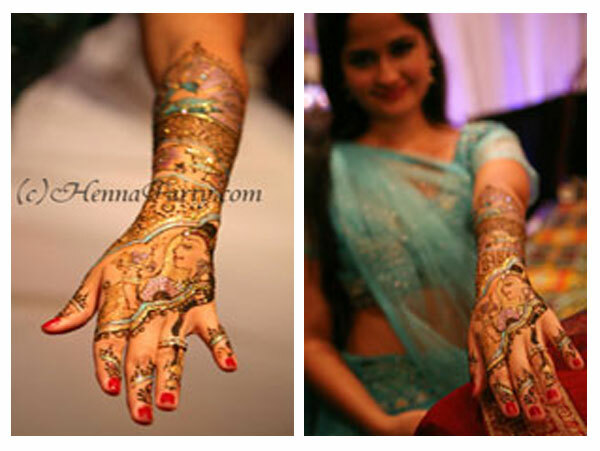 By incorporating a “bride” into the design, there is no mistaking that it is Bridal mehndi! The particular colors were chosen to complement the skin tone, dress and jewelry of my model. I do this for all of my brides so the mehndi is coordinated with the bridal look and colors she has chosen. Of course, the colors and crystals can be changed to coordinate with different looks throughout the wedding. Amber: I see it (henna) as a true artistic medium with vast creative possibilities. I have an education and background in art and design so seeing the possibilities and potential for beautiful henna designs comes naturally for me. My henna designs are inspired by textiles, jewelry, shapes, stories, rituals, colors, nature, people, patterns, flowers, fashion, fine art, culture, other henna works, etc. I have been a henna artist for eight years now and making the move from hobbyist to professional happened as I developed my skill and word spread about my work. These days, I am invited to do a variety of work in TV, movies, fashion, corporate launches, weddings and cultural events. I enjoy working with people and being of service, so contributing my artistry to joyous milestones like weddings is especially fulfilling for me. DV: How does it feel to be the winner for the 2012 Fort Lauderdale MyShadi Bridal Expo Mehndi Competition? Amber: I was nervous about it, but I also felt that it was a wonderful idea. I have had situations in the past where others would take pictures of my work and pass it off as their own. When you have a live competition with everyone watching, there can be no mistake about who created the work. That really appealed to me and I was excited to participate. I knew the folks at Desh-Videsh would do their part to ensure that the judging was fair and unbiased, so I just focused on giving my best. I am honored that my work received such recognition and I deeply appreciate the opportunity. DV: Now that you have this award, what’s next? Amber: I have a vision of where I would like to see this art form go, not just for me, but for my team (of henna artists) at HennaParty.com and for all professional henna artists. That vision includes a high degree of quality in professionalism, artistry, products and service. That is my focus. I am working on some exciting projects and products for this year so stay tuned. There might even be more awards along the way as well! You should like both the work and the personality of the artist you hire for your wedding mehndi. Weddings can be chaotic and many brides have told me how much they appreciate having a calming personality around them during their weddings. Mehndi should be a relaxing and beautiful experience. Ensure that quality products will be used and do a consultation well before your wedding to see what kind of color you will get from the henna. 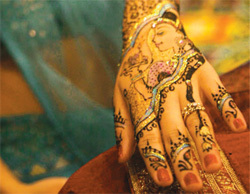 Professional artists offer bridal consultations that include a sample henna application just for this purpose. Reserve your henna artist well in advance. If you have decided on the artist you want for your mehndi, reserve them right away. Between 6-12 months before your wedding is a good general guideline to ensure you get your dates with the artist you have chosen. Have your manicure and pedicure done before the mehndi. Also ensure that your skin is clean and bare (no oils, lotions, perfumes, etc) for the Mehndi. Plan to have your mehndi done two full days (48 hours) before your wedding to give it time to darken fully. Natural henna needs this much time to darken and you should require that only premium natural henna is used. Amber of HennaParty.com is based in Plantation, Florida, but is happy to travel as her clients require. She can be contacted at 888-262-3783 or via www.HennaParty.com.